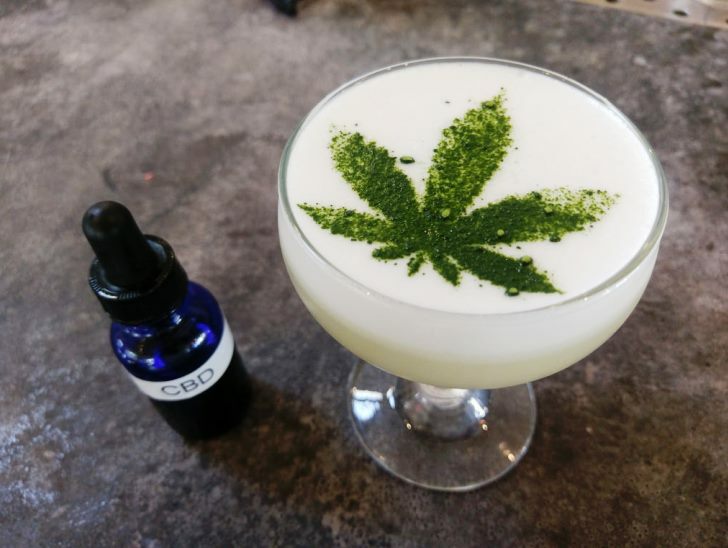 When news got out that a bar in West Hollywood is doing cannabis cocktails, naturally everyone jumped on it. Marijuana and booze? So naughty! And because recreational marijuana is not yet legalized in California—even though it is legal in Alaska, the state that gave us Sarah Palin—there’s a fascination with what sounds borderline illegal in L.A.
Eisner uses CBD (Cannibidoil), the legal element of cannabis, for purely culinary application in his three new drinks. CBD is present throughout a cannabis plant while THC is only available in large concentrations in the flowers. So if you take from the stalk, which is considered industrial hemp, that’s perfectly legal. They even sell CBD in health food stores like Lassen’s. But if you want to take from the flower, that’s when you’d need the doctor’s note and a medical card. And CBD won’t give you that psychotropic high that THC can. But really who needs THC? Apparently you get all the benefits of smoking a joint without the bad side effects like cotton mouth or anxiety. “CBD is a mood elevator,” explains Eisner. “It’s anti-anxiety, anti-inflammatory and anti-depression so you feel great and your body feels great so you actually do walk around like, ‘Life is awesome.’ You don’t feel out of sorts.” Plus, according to him there are actually trace elements of THC in all CBD. Now, I don’t do pot. I, uh, tried it once a lonnnng time ago, accidentally. And I don’t like the way it makes me feel and that it gives me an unquenchable thirst with that cotton mouth. But Eisner promised that I wouldn’t get that bad side effect and may actually enjoy the feeling it imparts. Still, when he presented me with all three cocktails, I didn’t finish them but rather took sips just to get a taste. And yet, by the time my interview was over I was buzzing hard like I drank two full regular cocktails. You might say that it’s because I’m a pot lightweight but one of my friends who is a recreational user said that she, too, felt it. Again, it’s not a mind-altering high, but a body-buzzing one. 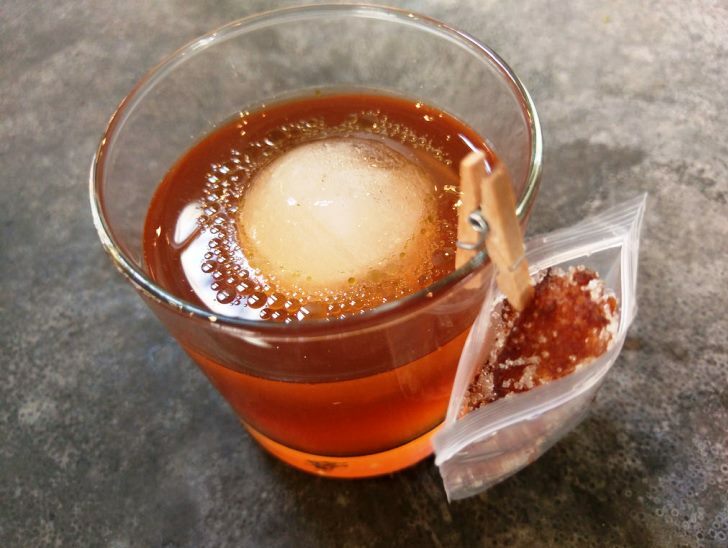 And for his Stoney Negroni, the super herbaceousness of the CBD oil that he adds to the top of the finished cocktail perfectly complemented the botanical notes of the gin. The only thing is if you sip away all the little CBD oil globs floating on top of the cocktail, that’s it for that flavor. 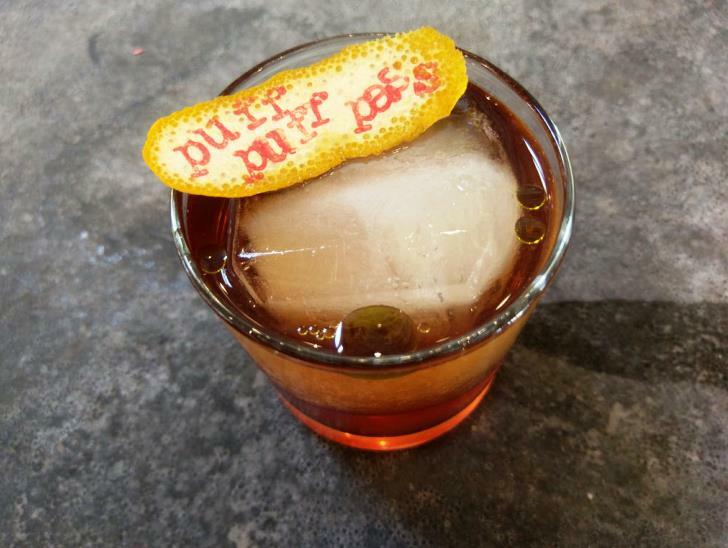 But you are left with a delicious Negroni and its appetite stimulating powers amplified. Good thing they happen to sell nachos here. Eisner’s Rolled Fashioned, a variation on a mezcal Old Fashioned, is a well-balanced cocktail but on the sweet side with those brief hits of vegetal notes from the CBD globules on the surface. The smokey mezcal combined with the CBD creates a pot-smokiness throughout. The mini churro in a dimebag is a cute garnish but, in my opinon, I would have preferred a savory bite to go along with the almost cola notes of the drink. Still Eisner said he’d pair it with Gracias Madre’s warm black bean brownie which is topped with mezcal caramel sauce and accompanied with coconut ice cream. Whereas the two aromatic cocktails “taste like you ate a Snoop Dogg album,” according to Eisner, the third cannabis cocktail, the Sour T-iesel, is more subtle. Initially you smell the hemp on the nose and then taste a hint of it but the more you sip the drink you get accustomed to it. If you want to drink through all three cocktails this would be the one to ease into it with. All three cocktails are currently available at Gracias Madre, while Gratitude in Newport only has the Negroni and Sour. By the way, if you like these, keep an eye out for even more cannabis cocktails on the horizon. Eisner says he has 30 recipes waiting to come out, including more classics, bottled cocktails, punches, and some Tiki. “I want to get funny with it,” he says. Gracias Madre, 8905 Melrose Ave., West Hollywood, graciasmadreweho.com.